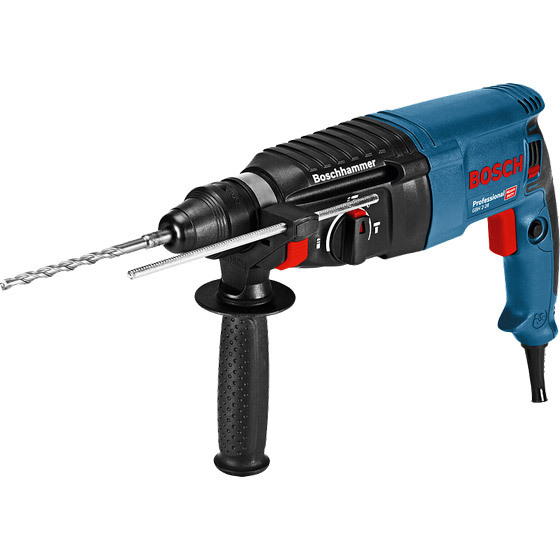 This Bosch hammer is a fast all rounder hammer drill for daily use, The 830 watt motor enables a fast drilling rate and the 2.7 joules of impact energy gives a high chiselling performance. It has been built with the highest of quality components making it one of the most reliable and robust SDS Hammers on the market. It's rotation stop covers a large range of applications for chiselling work and the variable speed provides the user with easy and precise control of the RPM. • Ball grommet for preventing cable breaks. • Rotating brush plate for equal power in both forward and reverse rotation. • Overload clutch to protect the machine aswell as the user. • Forward/ reverese rotation for dislodging jammed drill bits. • Continuously variable speed control for clean drilling starts. • Replaceable carbon brushes make maintaining this drill a very quick and easy proces , whilst the all metal gearing gives it a longer tool life. Compatible with a range of Bosch Accessories. Compatible with a range of Bosch Power Tools.